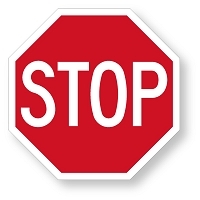 Relay message to the public using this Stop Sign. Great for warehouses, facilities also educational and instructional programs and make great gifts as well. Made from 4mm" Thick Corrugated Plastic available in 4 sizes printed one side; 8", 12", 15" and 18" lightweight and durable. Q: How much do the 8, 12, and 15 inch signs weigh? Are they reflective? Do they have handles? A: Hello. These are single sided stop signs without handles. (non reflective) These are very lightweight weighing approx. 4-8 oz. and we also offer a double sided aluminum stop sign with handle that has a reflective option (part number 252). Please feel free to call or email me if you have any other questions or would like help with an order.